I love books. Not just reading them. I love the books, themselves. I love the musty smell of old, dog-eared pages. I love the sound of the cracking spine as I open a book for the first time. I love the way books look lined up on my shelves. I love the library with its colorful shelves and attractive table displays of books. I love quirky bookmarks. For all these reasons, I have sworn I will never own a Nook, Kindle, or any other E-Reader. There’s a good reason your mother told you never to swear. I’m back pedaling. Fast. Books are bulky. They’re expensive. They require an outside lighting source. I have to drive to a bookstore to get them or wait for Amazon to deliver them. (Don’t get me started on my guilt for the treachery of abandoning my local bookstore for the convenience of Amazon.) 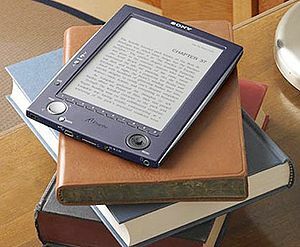 An E-Reader would solve all my problems. Any book I want I can have without wondering where I’m going to put it when I’m done reading it. I can read on my porch in the evenings without the porch light attracting the pesky bugs or in my bed without disturbing my dear husband. I will have access to any book I want whenever I want it, and it may even be free. Last but not least, I’ll have WiFi access. And yet, I’m hesitant. I’m not that girl. I own a basic cell phone for emergencies. I listen to music on the radio or CDs. I don’t have a laptop– I don’t even know if that’s the correct word. I can’t imagine sitting in a coffee shop, reading a book on an E-Reader. Not that I have time to read books in coffee shops, but if I did, a book is more me. Low-tech, traditional, and showing a little wear and tear. What about you? Do you prefer Books or Nooks? If you’re a Nook, did you go willingly or kicking and screaming? Here’s one reader’s thoughts on the subject. Added bonus? The Harry Potter angle. Off -Color Book from P.O.R.N. I will NEVER own a digital reader, and that’s a promise. The only thing that could maybe make me do it would be the apocalypse, so I could have more than just the books I could fit in a backpack. But where would I get the battery power? See! Conundrum! I will never turn away from the beauty of a real book – it would take away the experience of it, like going on vacation in your backyard: it’s fun, but just a tide-over. Ha, I already knew your opinion! I agree with the beauty part. But I don’t have room for more books! I want to keep them to read over and over again. I would never replace my favorite books. Jane Austen on a Nook? Absolute sacrilege. But the latest Nicholas Sparks I read just to get a little dose of sappiness? Definitely E-Reader worthy, right? (Apologies to any Nicholas Sparks fans. He’s just too…saccharine, for me.) I included a link to your P.O.R.N. post on the subject. I’d forgotten about it until you commented. I loved that one! I’m quite thenopposite. I was given a Kindle in January and i absolutely love it. I have instant access to any book I want, of any price and at any time. I do, however, miss the smell and the feeling of the pages but that doesn’t make it a deal breaker. I like to read because I like to learn and imagine, not because I like to hold the book or smell it. Another great reason to own a Kindle is that it takes up almost no space. I can take it virtually anywhere (filled with books I might add). Are you reading to enjoy the material within the book or to enjoy the object we call a book? Both. That’s the problem. The first time I read an Ernest Hemingway novel, it was an old, musty copy with pages so soft they felt like cotton. I fell in love with Hemingway that day and I will forever equate him with the experience of that first book. I’ve had similar experiences with other books and authors. However, reading Hemingway in a new book is just as enjoyable. It just doesn’t take me back to the discovery period. I’m not sure if i discover something on a Kindle, Nook, or whatever, I will have the same sensory experience, which is a shame. Sometimes, what something smelled like enhances the memory so much! (Good and bad.) But, great words are great words, regardless of the format. Any book I want when I want it is giving the old Nook an edge. Like everything else in my life, my reality with this question is a mess of contradictions. I love books. We are overrun with them. Last year, my husband & stepkids got me an iPad for mother’s day. A ridiculously extravagant gift. But I kept it. And boy, do I use the hell out of that Kindle app. In addition to being able to have a bajillion books in one place, there’s the instant gratification. Someone says, “Have you read. . .” and I look it up, hit the button, get the book. Sweet. There’s a whole new world of self publishing in the e-reader domain, which means people like me (but better) who haven’t sold their book yet, can sell their book, and I can get it. But I still buy real books too. I’m probably 50/50 with paper vs. Kindle. I’m currently halfway through the Norton Anthology of Literature by Women which is massive and annoying to carry, but I can’t imagine reading an e-version of it. And while the big chains put the mom & pops out of business, the e-readers have hit the big chains (or at least Borders). I know I’m not helping matters. I work in midtown Manhattan and nearly all the bookstores I knew of are closed. There aren’t ANY in a 15-mile radius from my suburban NJ town. I do use paperbackswap.com, even though I know the author doesn’t get money when I do that. Lots of guilt weighed against being able to live my life as an avid reader who works full time and writes when she can and is raising five kids. Simple wins out nearly every time. My formative years were spent reading books. I’ll never forget memories of turning pages in the wee hours because I just had to finish the last chapter and when I did I would reread the synopsis on the back cover just to relish once more the essence of what I had just read. I remember reading “Gone with the Wind” and going back to the dog-eared pages so I could read my favorite passages. I did the same when I read works by Miller, Kundera, Vonnegut, Huxley and Sartre. But I have to admit that now I swipe instead of turning pages and I bookmark instead of folding pages. Is the physical experience the same? No, but if I’m reading a worthwhile book the mental experience is there. A good book still makes me go “hmmm” about me, others and the world. Oh I LOVE Project Gutenberg … been using it for years and their human read audio recordings are excellent. There’s also Librivox for listening to audio books. I appreciated F. Scott Fitzgerald, but listening to “The Beautiful and Damned” made me love his narrative prose … it just sounds so beautiful. Face it we’re living in a digital world and it’s just a matter of time before print books disappear. I mean Borders and Barnes and Noble are closing all over the place. What does that tell you? It’s a shame, but it’s reality. You know, something that I had completely forgotten about are annotations. When I feel particularly moved by a passage or have a question about something I’ve read or want to underline a sentence that deserves to be a well-known quote, I pull out an archival pen and write in the margins. It’s so much fun to look through antique books and read these types of things – a literal glimpse into the mind of the person who held the book before you. Is there a way to add notes in the margins with digital readers? OMG, you are a genius! I love it when I get a used book that belonged to a college student. I read their thoughts and sometimes find something I hadn’t considered or I completely disagree. Either way it deepens my understanding/knowledge of the book. Finally, something tangible! I will tell you – I always loved having actual books. However, over time, I stopped buying. After several moves where I had to lug very heavy boxes of books from place to place, I realized I had no interest in adding to my collection. Then I started getting rid of them. I sold them, then gave them away. Every time I went to a book store I wanted to buy one, then realized I didn’t want to store it. I have read more in the last 6 months than I have in the last 6 years. I have about 30 books so far stored on my Kindle, including the Bible which I have in several versions, including commentary. I can do everything I do with a regular book. I can underline, highlight, bookmark – you name it. Plus I can search, I have a dictionary of any word instantly. And it is always with me. I can choose any book to read at any time, without having to remember to take it with me. I just have this one item, and all my books are with me. I like the idea that a Kindle makes people read more. People need to read more. I also understand the convenience. And I have a box of books in my car to donate to the library. They aren’t ones I care to own. It’s possible to bookmark, highlight, and underline. Is it possible to make notes anywhere? Normally, they would be in the margins. Is there a way to make a notes page for an ebook? I just recently moved and one of the worst parts was carrying boxes of books up to a third floor apartment. I donated a lot of them, but I couldn’t part with some. That being said, I think I will buy a Kindle for new reading, but buy books for classics and others that I cherish. I make notes all the time. In fact, all you have to do is move the cursor to where you want to make a note, and start typing. When you are finished with your note, you get a little marker so whenever you go back to that page you can see the notes you have made. Trust me, you need to give it a try. Slowly coming around. FYI, I don’t EVER check or send e-mail on my phone. In fact, I didn’t own a phone capable of doing so until a few months ago. I have also sent less than 100 text messages in my lifetime, but I do think it’s a marvelous thing. Your vinyl records analogy is great. Books, I suppose, will be the new “vinyl,” a collector’s item. If I get a Kindle, I will still buy my favorite books in book form. >>If I get a Kindle, I will still buy my favorite books in book form. Denial is a strong thing my friend. That’s what I thought too. Trust me, you won’t…. When did I get so wishy-washy? I don’t use an e-reader and don’t intend to. I like holding books in my hands and reading them, and when I’m reading I’m taking a break from the electronic world. Perhaps I may use an e-reader in the future but at this point in time I’m not interested. “taking a break from the electronic world.” I like that very much. I like reading outside while enjoying nature and an e-reader would definitely be an intrusion. Real books all the time! I don’t own a cell phone, nor a Nook nor a Kindle. I have a laptop that has thus far lasted five years, and it’s here where I spend most of my time staring into internet oblivion reading. When I want to dive into a novel, I want a book. You know the old skool kind … with real pages, preferably one that’s been read several times. I have a thing for people’s old books, I always shop for books in second hand bookstores or second hand on the net. When I pick up my book I love the smell, the feel of the pages, the weight of the 1000 pounder Im about to sink into. When I read my book I want my covers pulled up to my neck, soft lightening in the corner. I’ve seen people reading on e-readers in the airports and I’ve thought silently to myself .. what snobs. Maybe Im old fashioned but I think technology has it’s limits and this one is for me. I’m guilty of judging people with e-readers, too. It always looks as if they’re reading with a condescending smirk on their faces. I guess it’s me projecting, but I still see it. Oh, and the absolute worst commercial in the world is the Nook Color ad with the little girl passed out on the floor clutching her nook. That is just not right! My daughter (19-month-old) loves books and there is nothing sweeter than a book opened across her chubby little knees while she joyfully turns the pages. She loves flipping through those pages! While I love having real books, I’ve simply run out of room for them. I read 60+ books a year and I have an hour and a half commute everyday, so most books I buy go on my Kindle. If you read a only a few books a year, stick with real books. If you read a lot though, an e-reader is the way to go. My Kindle is only missing one thing, and I wrote a post about it, if you’re curious. I read about that many, but I don’t buy them. The public library is my favorite place on earth. I’m in there at least once a week to pick up my reserved books. I’m never sure what’s come in. It’s like Christmas. I understand the convenience of a Kindle for the commute, though. Some books are too bulky to carry and God forbid you should finish a book en route. I always hate when that happens when I’m traveling. You should submit your book smell idea to Kindle. I’m sure a lot of people are missing that, too. I would so pay for Dusty Tome. You’ll be able to check out books from your library on Kindle starting soon, I can’t wait! But yes, I love being able to start a new book immediately after finishing it when I’m on my commute. I do miss visiting book stores, but all my favorite local book stores have closed down anyway. Dusty Tome is my favorite too, although I’m also fond of New Paperback. In light of recent events, I am getting a Nook Color ASAP. And I’m keeping it in my car. I now have 1 book. A friend gave me a copy of Pride and Prejudice. At least it’s my favorite. Before you get the nook, walk into a Barnes and Noble and take a look at them. They just came out with one that looks almost exactly like the kindle. Listen I know color seems like a great idea, but think about it first. The color nook has a lot of glare because of the type of screen they need to use to give you color. The new one they have is black and white and so is the kindle. After hours of reading, what you really want is something that emulates the ink of a book. The color, the flash, the audio/video capabilities, it reads to my children if I want it to, and the apps. The lovely, lovely apps. I am the reader who wants “The Reader’s Tablet.” That marketing campaign was aimed directly at me and it worked. 🙂 I have time to reconsider. I think it’s more important for me to get beds and some towels, pots, and pans before the Nook, color or otherwise. Don’t you? I did a review of the kindle a while back. A great device for travelling. I actually like these things. Perhaps I’d get one one day. mmm… I’m more a fan of the amazon kindle than the nook. It’s faster and I like the design more. Also, I think that amazon is the future of books moreso than barnes&noble. They’re going through a tough change right now. Lol, I love those same things about books. The only problem is you can’t bring many books to college. Kindle is the more popular option, but I needed the “Nooks” to rhyme with “Books,” you know? 🙂 BTW, I have a Nook Color now and I LOVE it. Lol dats true. Nook color? Interesting. The only thing I don’t like about the kindle is the web browsing sux.